Today's post stars another of Sage's friends - a 5 year old (mixed breed) called Poppy. 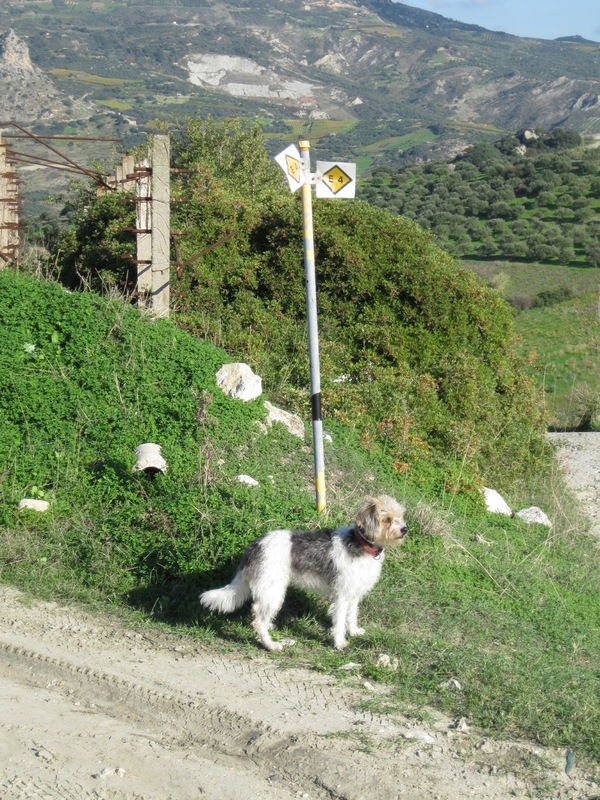 Having been adopted by an energetic, nature-loving couple, Poppy has probably covered more hiking routes around Crete than anyone else I know. 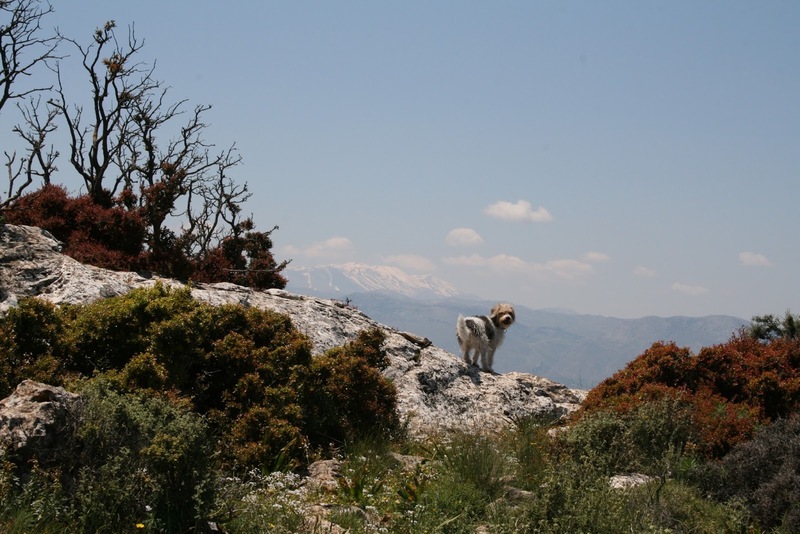 It gives this description of the Archanes-Profitis Ilias route: "... from Archanes to Ano Asites, perched on the west of the Ida range of mountains. On the south-western side of Archanes, a rather pretty trail skirts the southern side of Mount Juktas, and half an hour after setting off, you can reach the mountain's other side. You may spot E4 sign followed soon after, as you head north. Another sign suggests that you could head west, but you could also find yet another sign painted onto the side of the mountain to continue walking North. This will take you through a village before heading west to the village of Profitis Ilias and the church of Pouka..."
I think that description says it all. There are sign-posted paths, but the trails are often hard to follow. You should equip yourself with a map and know your route before you set out, unless you are happy to just wander. 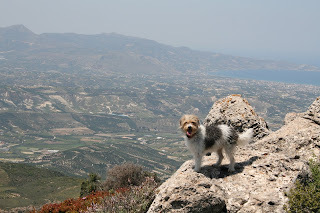 I've also climbed up Mount Juktas, although I didn't continue along the E4 afterwards. Sage and I walked up on the road that climbs right up to the church at the top. It was a longish walk, but fairly easy. 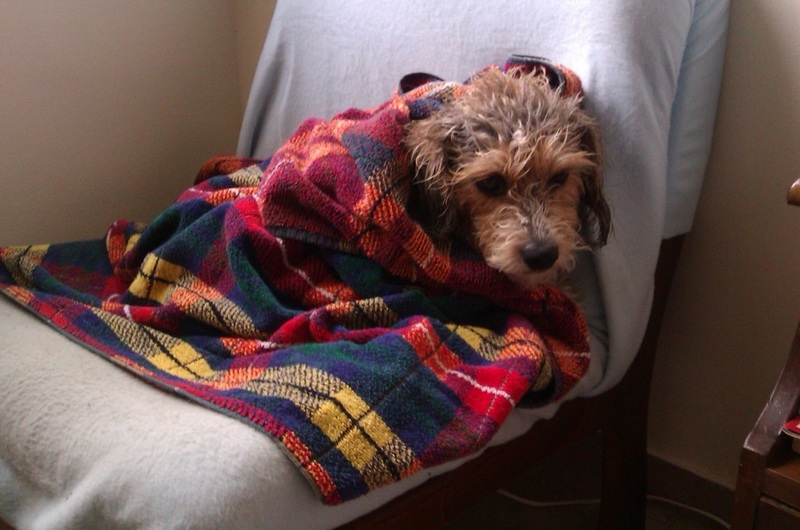 We did this at Easter last year, April time, so it wasn't too hot. Along the road there are all sorts of wild flowers and herbs growing, and the smell of wild sage and thyme is incredible. 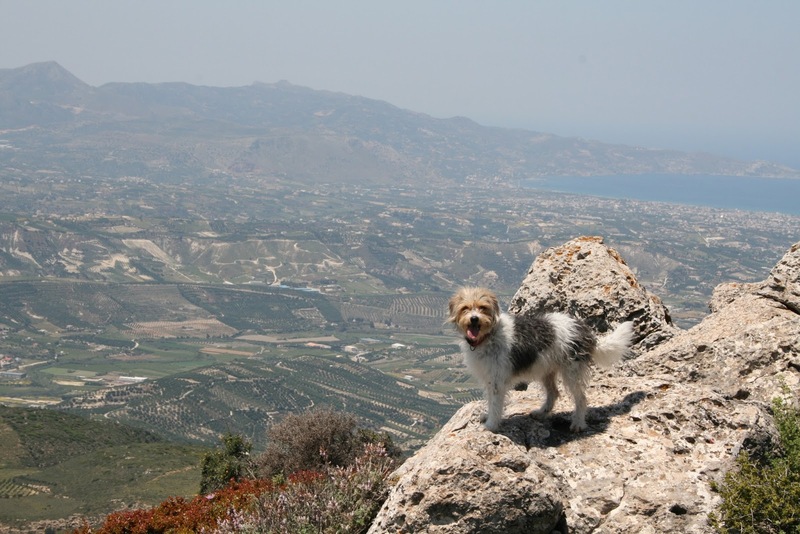 At the top of Yuktas, apart from a modern church, and incredible views (those that Poppy is admiring in the photos), there is also a Minoan peak sanctuary. 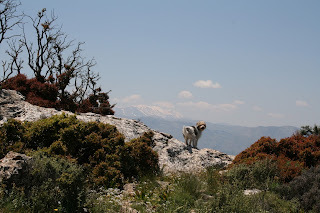 This peak sanctuary is somewhat grander than most found around Crete (and there are quite a few! ), arguably because it seems to have served the Minoan Palace at Knossos. This site was first excavated by Arthur Evans in the early 20th century, then again from the 1974-90 by Alexandra Karetsou. The exact nature of rituals that took place at peak sanctuaries is still debated by scholars, although it is clear that they combine central factors such as: pilgrimage up to the site; dedication of offerings (clay figurines, but probably food and/or wine too); and feasting. There is a fence around the peak sanctuary, but the site is mostly visible from outside. A second archaeological site which is of interest is found further down the slopes of Juktas. This small but significant site - Anemospilia - was excavated in '79 by Y.Sakellerakis, and was said to preserve evidence of human sacrifice. A building had collapsed and preserved a group of figures, said to be in the midst of a ritual. The argument continued that perhaps they were enacting a drastic ritual to prevent the very earthquake that interrupted and killed them. Anemospilia is fenced off and closed to the public. There is very little to see except the foundations of three narrow rooms, overgrown with weeds. It is a place to visit and think about the story, to wonder whether the peace-loving Minoans actually committed such acts, rather than a place to marvel at what remains. 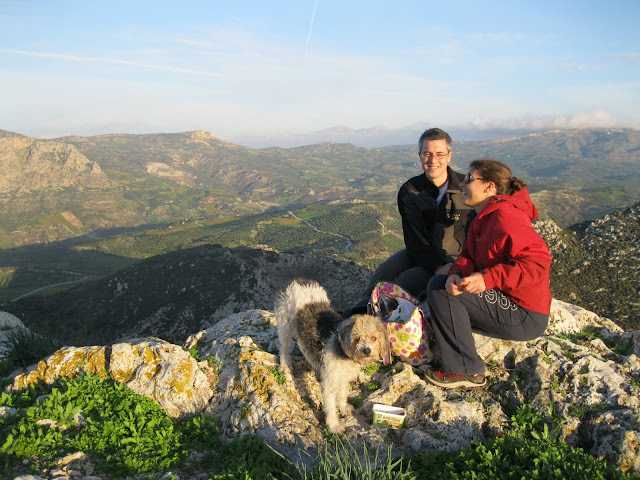 Naturally, in addition to the E4, there are numerous paths to explore, mountains to climb, gorge's to hike through... There are nature trails that lead along the coast, passing by endless deserted coves and inviting places to stop for a swim. There are trails that wind up through the mountains, yielding views of coast, fertile plains, valleys, more mountains. There are yet more trails that link small villages, isolated churches, fields and agriculture, archaeological sites.... You can pretty much head out of any Cretan town and just start walking. Or you can go to any one of a number of websites and find routes mapped that will ensure that you find water, shade, places to stay, manageable hikes etc, depending on your criteria.